The six Malian artists of Groupe Bogolan Kasobane—Kandioura Coulibaly, Kletigui Dembele, Boubacar Doumbia, Souleymane Goro, Baba Keita, and Nene Thiam—are largely responsible for having elevated bogolan, a traditional textile technique used to decorate garments, to an important symbol of national and even pan-national identity. Although usually translated as “mud cloth,” bogolan actually refers to a clay slip with a high iron content that produces a black pigment when applied to handspun and handwoven cotton textiles. The members of the group met as students at the Institut National des Arts in Bamako in the mid-1970s. At that time, bogolan was rarely seen in urban areas and was fabricated only by rural women. The study of bogolan was also strictly forbidden at the art academy. 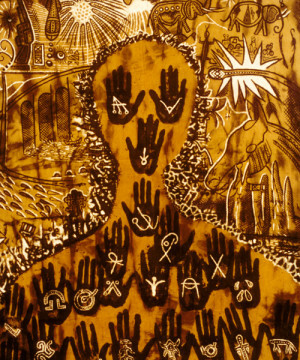 Coulibaly rallied five other like-minded artists who fought to employ it in their paintings as a way to reference their Malian heritage. 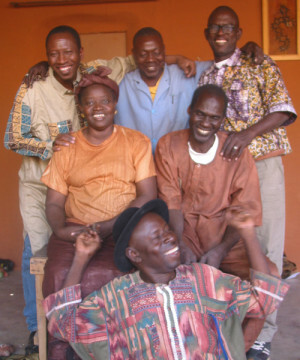 The members of Groupe Bogolan Kasobane subsequently conducted in-depth research throughout Mali, living in villages for months and becoming integrated into the communities. From village practitioners, they learned the vocabulary of symbolic ideograms as well as the meanings of the traditional colors and patterns encoded in bogolan. Working collaboratively and developing new approaches to this centuries’-old technique, they have continued to feature it in their art and award-winning costume and set designs for film and stage as well as fabrics for fashion and home furnishings. They, like other African intellectuals, are part of a larger effort to uncover and reconstruct histories that were disrupted and erased by colonialism. Their insistence on using local resources and “elevating” materials associated with craft are strategies employed by many contemporary artists throughout the world. 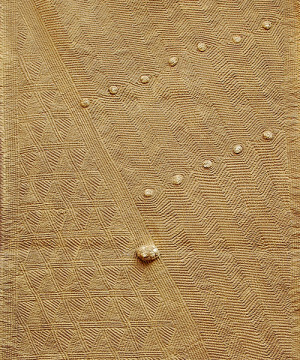 The members of Groupe Bogolan Kasobane have adapted another Malian textile tradition that they call gauffrage, French for “waffling.” Inspired by the thick cotton hats worn by Malian hunters for protection from both physical and spiritual hazards, they fabricate works of art by sewing overall linear and geometric designs into double-layered cotton fabrics. The cloths are then stuffed to create a ribbed quiltlike effect. Not unlike hunters, who are sensitive to their environment as they search for food, medicines, and other community needs, Groupe Bogolan Kasobane continues its quest for intellectual and artistic ideals of beauty and cultural preservation. Janet’s collaboration with Kasobane stems from their strikingly similar worldview across culture and across education. They have let each other into their lives, artistic process so all are simultaneously researcher and subject. They are all about the same age. They are all interested in cultural preservation, researching history and preserving it by bringing the ideas, forms, techniques of the past forward into the present and the future. 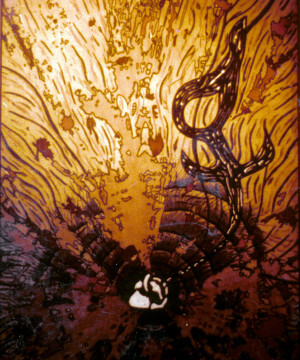 The results of the collaboration can be seen in artwork, published articles, photographs, video, ideas, and friendships. The larger project, as yet unrealized, is to find the means to establish a museum/cultural center in Bamako to house the world class collection of beads, textiles and other artifacts so that they could be of service to artists, researchers, visitors and most importantly Malian youth. A first step would be the funding to conduct an inventory.